Villa Mo El Portillo, Enjoy this wonderful Villa steps from the Beach.. Very spacious and cozy villa. Great for families, couples and kitesurfers !!! 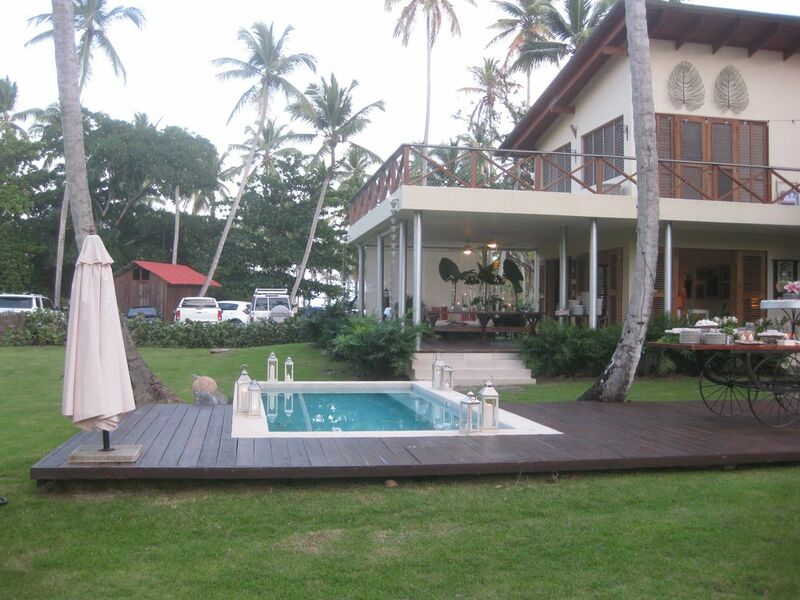 Come, enjoy and relax in this beautiful, open spaced, oceanview Villa, 1 minute walk or 50 steps from the beach. Let yourself be delighted by our white sand and pristine clear water beaches, surrounded by tropical nature and many many coconut trees. Our beach is almost private, never full of people. Let yourself be endulged by Yani, our wonderful cook/housekepper, who comes to the Villa everyday from 8 am to 5 pm and can prepare the most delicious meals for you. She can do your laundry and maintains the house very clean always. Villa Mo is a family owned house with 3 very big bedrooms with many windows and 3.5 bathrooms. All our rooms have air conditioning, two ceiling fans, walk in closet and bathroom. We also have an indoor living room and outdoor big terrace with beautiful ocean views, indoor and outdoor dining room, fully equipped kitchen, private pool, deck and patio. You can see and hear the ocean waves from all the bedrooms in the Villa, from the terraces and kitchen. Villa Mo has private security guards available 24/7 all year round in Residencial El Portillo. It's ideal for families with children, couples, groups. In front of the Villa, our beach is a great spot for Kite Surfers. You can be delighted or just entertained yourself watching the kite surfers jump in the water or take private lessons that the schools have to offer. We are 5 minutes away by car to Las Terrenas town. It's easy to move around either by car or taxi and to vist other wonderful beaches nearby, like Las Ballenas Beach in Las Terrenas,, Coson, Playa Bonita, Las Galeras, Playa Rincon, and other attractions like La Cascada del Limon (Limon Waterfalls- 15 minutes away), Zip Lines, Excursions to our Natural Park Los Haitises, and Whale watching (Jan-Apr). Many others. We help you book your excursions and offer all the information needed thru our Local Guides. La Bodega de Portillo is a small well supplied supermarket at walking distance from the Villa. It's a family owned business since 1953. This is a MUST if you are in the area. It avoids paying for a taxi or the hassle of Las Terrenas town by car. The minimarket delivers groceries to the Villa. One or Two (2) maids for Housekeeping and Cooking depending on the amount of people from 8:00 am to 5:00 pm except on Sunday (on a weekly basis) and their schedule is flexible according to your needs. Taxi Service for Pick Up and Drop Off at Airports at your own expense. Taxi rate $10 dollars one way to Las Terrenas town. El Catey International Airport, Samana – 30 minutes drive for $75 dollars thru a new scenic toll road. Tours, Excursions and Car Rentals in Las Terrenas Village at market price. DREAMS DO COME TRUE !!!! It was always our dream to semi retire in this place we call PARADISE. After 30 years, it became a reality. This land was my grandfather's farm since 1937. My father, a agricultural engineer, came to live here as a newlywed in 1953. During my early chilhood years, my parents lived here, when there were no roads, electricity or water supply. We used to come here by boat from Puerto Plata (North part of Island) or crossing the mountains (in Samana) by horses, a 4-5 hour ride, a real challenge and experience for my older sisters and myself.. After going back to Puerto Plata for school, we always came back and spent all summers, and special occasions here. My most wonderful memories are of this place and I made my dream come true when it was the right time to build our house and live here all year round with my husband, and our Shitzu dogs, Ali and Gia. IT IS OUR REAL PARADISE ON EARTH. A very short walk- 1-2 minute - to the beach Kite Surfing in front of Villa No crowds of people at any time La Bodega de Portillo is a small supermarket at walking distance from the Villa. It keeps it's name since 1953 when it was founded to supply the needs of all the locals in the area. It's a MUST in the area and very convenient to have a supermarket so close by to buy your groceries. They also have "delivery" service to the Villa. Fresh Seafood every day at our local Fish Market in Las Terrenas Wonderful to relax Great for Families with children Inside Gated Residential Area Very Tropical Landscape. Need nightlife and other activities? Las Terrenas Village, 5 km away from the Villa, is a very unique, bohemian chic experience with a big mix of local Dominicans, Americans, French, Italian, Spanish, German and other Europeans living here full time, this makes the town of Las Terrenas an upscale Caribbean experience with amazing fine dining in wonderful restaurants along the coast, night clubs, bars and amazing bakeries where you can find very good fresh baked bread and pastries. We have a half bathroom in the first level. Very very near the ocean. 50 steps or a two minute walk.. maybe less if you are a fast walker..
We are inside a gated community called Residencial Portillo. Where ever you are in Villa Mo you can see the ocean. Beach is beautiful. White sand and very clear water. We are 50 steps from the ocean or a two minute walk.. maybe less. You can see and listen to the ocean waves from every room in Villa Mo. The location is just perfect. We can provide groceries to our guests at your own expense. The housekeeper/cook is a wonderful easy going person and can cook for you. She's a great cook and can prepare wonderful typical and many different dishes for you. We provide a written menu with dishes she makes really well and you can choose from there. Guests usually send a list of groceries they would like to have upon arrival and I buy them for you. Payment is done against invoices. This service is free. It keeps me busy and I enjoy doing this for all my guests. A meal can be ready the day of arrival..we get in touch via email, and I will offer you what we can have prepared for you. Our housekeeper/maid comes in everyday from 8 am to 4-5 pm. On a weekly basis, she needs a day off. She cleans the Villa, can cook and do your laundry. Clean and beautiful house and furnishings, comfortable beds, just a few steps from one the best beaches we've ever seen - virtually empty and you can walk for miles, with good snorkeling. Perhaps best of all is the generous support and interest of the owner, Monica and her husband Cuqui who did everything they could to make our stay very special. Monica answered our many questions and worked with us to resolve dietary issues. Yani's meals are so delicious, all the raves of other reviewers are justified - she is very sweet and eager to please. There is some construction nearby but that should be finished before too long (we stayed March 2019); the septic system is delicate; otherwise a wonderful place to stay. If you fly into Santo Domingo airport, and plan to take a taxi, we suggest you ask Monica to arrange it since the local drivers know the quickest way to go. It's fun to go to the fish market with Yani (you cannot buy fresher fish! ), and there is a very good French bakery in Las Terrenas. All four of us really enjoyed our great stay at Villa Mo. Clean and beautiful house and furnishings, comfortable beds, just a few steps from one the best beaches we've ever seen - virtually empty and you can walk for miles, with good snorkeling. Perhaps best of all is the generous support and interest of the owner, Monica and her husband Cuqui who did everything they could to make our stay very special. Monica answered our many questions and worked with us to resolve dietary issues. Yani's meals are so delicious, all the raves of other reviewers are justified - she is very sweet and eager to please. There is some construction nearby but that should be finished before too long (we stayed March 2019), otherwise a wonderful place to stay. If you fly into Santo Domingo airport, and plan to take a taxi, we suggest you ask Monica to arrange it since the local drivers know the quickest way to go. It’s fun to go to the fish market with Yani (you cannot buy fresher fish! ), and there is a very good French bakery in Las Terrenas. All four of us really enjoyed our great stay at Villa Mo. We recently returned from a 2 week stay at Villa Mo. While the Midwest was fighting through a blizzard, we were enjoying sunny days and cool breezes at night! Villa Mo is a wonderful, clean, comfortable home! Monica, the owner, makes sure that your visit is perfect. She works hard beforehand by grocery shopping and even made a flan dessert for us! Yanni, the chef/housekeeper, also works hard to make sure everything is enjoyable! She is an excellent cook! Our days were spent relaxing by the pool or one of the patio areas, or walking down to the nearby beach. We were all impressed by the comfortable, high quality furniture. The 3 master bedrooms are large and well furnished. Monica is the owner of a nearby Bodega which made it very convenient to order groceries or drinks to be delivered! One night the groundskeeper made a bonfire on the beach. It was awesome! I highly recommend this property to anyone who needs a relaxing vacation! Thank you so very much for your kind words. It was our pleasure to know you and to have you enjoyed Villa Mo along with your friends. I'm glad you had a safe trip back home.. come back soon some day. Spacious, well appointed villa, fabulous beaches. Wonderful service from housekeeper cook Yanni. We spent 10 days in Jan. 2019 at Villa Mo. We were 4 adults and 2 small children. The villa was very confortable with large, airy bedrooms, a variety of open air eating and sitting areas, a large yard and a small pool that was great for the kids. Janni the cook made us delicious meals and did all the cleaning. She was great....always pleasant, helpful and friendly. A short walk to miles of the most beautiful beach with hardly anyone there. Calm water great for swimming with the kids. Overall a very relaxing, scenic and secure holiday venue. Grandparents, parents and children all enjoyed it immensely. There are some renovations underway at some of the nearby villas but this did not disturb us. We can recommend Villa Mo highly especially for families. We just got back from a 2 week-long stay at Villa Mo with our extended family (6 adults and 5 kids from 2 – 13 years old) and everybody truly enjoyed this vacation. Every day was better than the last, we did not want to go home…. We loved the open concept setting with the different outdoor space and terraces, the house is nicely decorated, and the kids loved to play in the pool and in the large garden and everybody enjoyed the incredible beach, that is 1-minute walk away. Often in the afternoon we walked with the kids for an ice-cream to the close by store “La Bodega” and almost daily used the service to have things we need delivered to the front door, very convenient!! Monica is a great host, she goes out of her way to make sure your stay is perfect. We can’t wait to go back, hopefully soon!!! Thank you, Monica, Yani and all the Villa Mo staff for your hospitality and for making this a very memorable vacation for our family!!! Thank you so much for your wonderful review. It is our goal to make our guests feel like at home away from home. I'm very glad Yani was so helpful. She's my other half. Hope to see you and your family back to Villa Mo. We spent two wonderful weeks with different family members of all ages at Villa Mo. We really enjoyed our stay at this beautiful, quiet, clean and well-maintained Villa. The property offers a lot of different facilities and uncountable places to relax, swim, snorkel, go for a walk nearby. The City Center of Las Terrenas is not far away, but we preferred staying at our quiet Caribbean Paradise. We only went there for shopping. We appreciated very much that the owners of the Villa live in a separate part of the house and that they have a lovely house-keeper. She is very friendly and helpful and apart of this a very, very good cook! -We loved her food and only went out for dinner once, as we liked her food so much. The owners run a small Supermarket just a five minutes walk away from the Villa, witch is very helpful if you want to buy small things. We can highly recommend the property because of its beauty, safety and modern interior design. The beach, witch is very close to the property, is very beautiful, clean and quiet. Thank you very much for this terrific holidays! We really enjoyed it and will come back one day. We appreciate your nice review. It makes us feel good when our guests enjoy their stay in our Villa. We love sharing our paradise with you. Hope to see you soon someday. We are located inside a gated community called Residencial El Portillo. We have a wonderful Housekeeper that comes in everyday from 8 am to 5-6 pm. She will cook delicious meals for you. You buy your groceries or we can buy them for you and you pay us against invoices. She's an easy going person, always in a good mood. Rates are based on 12 guests (including children). Additional guests, please talk to owner. Monthly Rate only during May, September and October. Please talk to owner. Check in is at 3-4 pm Check out is 11 am-Noon if we have another reservation the same day. If not, you can stay longer.